The Avatar is the spirit of the planet incarnated in human form and thus, the only physical being with the ability to learn all four bending disciplines. It is considered the Avatar's duty to master the four elements and use such power to keep balance among the four nations of the world, as well as between mankind and spirits. With the death of the Avatar, the spirit is reborn into the following nation, dictated by the cyclic order; water, earth, fire, air. Coincidentally, the cycle of reincarnation corresponds to the cycle of the seasons; each of which is affiliated with a particular nation and element; water and winter, earth and spring, fire and summer, air and autumn. The cycle is also the traditional order in which any one Avatar is to master the elements, beginning at whichever element they were born into. The cycle can only be broken if the Avatar dies while using the Avatar State. The Avatar possesses an innate connection to the Spirit World and uses it as a bridge by which to reconcile the two worlds and ensure harmony. The Avatar is also capable of using this ability to contact the spirits of previous Avatars and harness their combined energy to perform feats of bending beyond that of any other bender and enter a state called "Avatar state". Throughout the ages, countless incarnations of the Avatar have served to maintain harmony in the world. Each nation has a method of recognizing the new Avatar. Among the Air Nomads, this involved presenting all infants with a selection of toys to play with and watching for a child that selected four specific toys that had belonged to past Avatars, called the four Avatar relics. Traditionally, the child is told of his identity as the Avatar on his sixteenth birthday. The Avatar also possesses the ability to bend energy, though very few Avatars have learned this technique, and even fewer have used it. The first Avatar learned this technique from the last living lion turtle and used it to remove the bending of a great evil firebender, thereby ending the Hundred Year War.Avatar's of modern times must spend time with their past reincarnations to learn energy bending. When the Avatar masters control of the Avatar State, they are commonly said to be a 'Fully Realized Avatar'. There are certain Specialties that only Avatars that are born in certain Nations have, these abilities also help determine if a child is the Avatar at a young age. *Note:* Avatar characters created must have one of these depending on the nation it was born in lets you know which one to put on your app. The Special characteristics will not go toward your total Characteristic count. Avatars of the Earth Kingdom live for abnormally long times and can live for up to 250 years of age and still hold the power and talent of a "Fully Realized Avatar". The skin of a young earth Avatar is impenetrable at birth but by the age of five it softens and from that point on only adept rank weapons and on can penetrate this young Avatars skin. This is how Earth nations were able to tell if new-born babies were the Avatar. Avatar's of the Earth nation can speak to Giant Badger moles and are given a Baby Giant badger mole once the Avatar has reached the age of 10 to accompany him/her on their pilgrimage. Avatars of the Nomadic Air temples are more connected to the spirit world then any other Avatar. They are capable of feeling the connection between past Avatars and the things they came into contact with in the physical world. Which explains why the Air monks use the toys of the past Avatars to determine the Air Avatar. Avatars of the Air temples have the ability to "Run like the wind" Avatars born in the Air Temples can run up to 60 M.P.H. at a young age. Unfortunately this speed greatly falls to 40 M.P.H. at the end of puberty (About the Age of 20). At the young age of 5 Air Avatars are given a Sky Bison that will accompany the young Avatar through out his/her pilgrimage and the rest of the Avatars natural life. Air Avatars have to ability to speak to Sky bison. Avatars of the Fire nation have a deeper comprehension of the beauty of bending and is the only Avatar capable of gaining his/her Advanced element in the element of their choosing. Unlike the other Avatars who may only obtain the advanced Element pertaining to their original element. Fire Avatars have the ability to speak to the rare and powerful beings called Dragons. 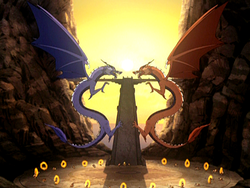 Upon their first visit into the spirit world the Fire Avatar is usually approached by a dragon who would then come into the physical world and serve as the Avatars partner for life. This dragon will accompany the Fire Avatar and help him through out his/her Pilgrimage. Water Avatar are some of the more empathetic Avatar known to the world. Water Avatar are capable of calming the minds of raging spirits easier than any other Avatar would. The reason for this is that when a spirit rages it usually has a reason. Being the Water Avatar they are they have a great talent when it comes to seeing the Spirit's point of view and convincing it that the end result of the situation will be fine. This empathetic connection also happens with people, but those who notice it feel it as an overwhelming kindness. Water Avatars can understand and speak to any animal. At the age of four a Water Avatar is given a baby Polar bear Dog. This Polar bear Dog is very loyal and shall protect and accompany its owner through out his/her natural life. This includes the entire time of the Avatar's pilgrimage and a bit more. Energybending is the ability to bend another person's life energy. It predates the four main bending arts, the formation of the four nations, as well as the arrival of the Avatar. Before the Avatar came into existence and the separation of the four elements, people bent the energy within themselves. Eventually, they discovered the other four bending arts, and, over time, the knowledge to perform energy bending was almost completely lost. An ancient known keeper of the art was an ancient lion turtle, who later passed it down to The first Avatar. The art of energybending has been imbued in past Avatars, though extremely rarely. The capabilities of energybending are not well understood; what is known is that bending a person's life energy can impart them with knowledge instantly, remove one's bending completely, or restore one's bending. This bending art is dissimilar to the others because it is so perilous to the user, which is why so few have ever used it. In addition, unlike how the four bending arts are a complete necessity for the Avatar to learn, energybending is optional and must come after his/her Pilgrimage is complete. Description:The ability to transfer knowledge from one user to the other, originally done by the lion turtle when he granted the First Avatar the knowledge of energy bending. This process requires a full post of contact between the users thumb to the targets forehead. The amount of knowledge that can be passed in a matter of seconds is only limited by the amount of knowledge the Avatar has. Description: The ability to remove a person's bending permanently, unless restored by an energybender. This is a very dangerous process for if the bender is lower in rank by more than one then they will be infected by the spirit of the one they are bending. As a result, the bender can be corrupted and even destroyed. By placing a thumb onto the forehead and another onto the heart the Avatar is capable of bending a person's inner energy known as "chi". Using this ability an Avatar will bend a persons spirit to the point where they cannot channel chi through their body anymore and become unable to bend. This process requires 3 posts of physical contact on the area's stated above. After having your bending removed the Avatar has the ability to grant it back using the same technique reversed. By placing a thumb onto the forehead and another onto the heart the Avatar is capable of bending a person's inner energy known as "chi". Using this ability an Avatar will bend a persons spirit back to the point where they are able channel chi through their body again and regain the ability to bend. This process requires 2 posts of physical contact on the area's stated above. Avatars will start in their nation of choice (Only one Avatar per nation can exist at the same time). Members who have been Avatars can no longer Roleplay Avatar characters until he/she has played through at least 5 topics with a character from each Nation.When an Avatar is killed it reincarnates it is up to staff who gets the opened position. Anyone who has not been an Avatar before is eligible please do not hesitate to as if you see an open spot. All Avatars must start with the single element of their nation and then must begin their pilgrimage to master the others. During the Pilgrimage an Avatar will set out in search of teachers of General rank or above to teach them the elements they need. The Avatar are adept learners and learn to bend elements at Soldier level after seeing it done once. From that point on the Avatar will need to complete Training Topics of at least 2000 words each in order to rank up in that element once. For every 2000 word Topic an Avatar will rank up once in the Element that they trained. Once the Avatar has trained all four original elements they will become fully realized Avatar's and shall then begin to train their Avatar state. The Avatar State is a defense mechanism, designed to empower you with the skills and knowledge of all the past Avatars. The glow is the combination of all your past lives, focusing their energy through your body. In the Avatar State, you are at your most powerful, but you are also at your most vulnerable. If you are killed in the Avatar State, the reincarnation cycle of that Avatars home land will be broken and the Avatar will cease to exist in that Nation. The Avatar state is strongest and most powerful ability that the Avatar can invoke. It allows the Avatar to channel vast cosmic energies and the knowledge of previous Avatars, enabling them to perform especially powerful and extraordinary bending feats. The Unrealized Avatar may unconsciously enter the state in response to perception of mortal danger, utilizing the state as a defense mechanism, or emotional distress.This form of avatar state is called "Continuous" While in the state, the Avatar has access to bending techniques they themselves may not have yet learnt (such as a Fire Avatar who has yet to learn waterbending will be able to do so in Avatar state), but have no conscious control over their actions and can cause great collateral damage. While in the Avatar State, the Avatar's eyes glow, as do any markings following chi paths along the body, such as Air Nomad tattoos; however, if the body has received an injury deeper than the tattoos, then that specific area will not glow in the state. The glow is the combination of all the Avatar's past lives, focusing their energy through a single body. When an Avatar speaks in the Avatar State, his/her voice is encompassed by a combination of several different voices at once. The Avatar can learn to control this state after becoming a Fully Realized Avatar by doing a training topic of at least 3000 words on his own(NPC's do not count against this) in the spirit world. Once done the Avatar will gain access to the alternate form of the Avatar state called "Non-continuous". 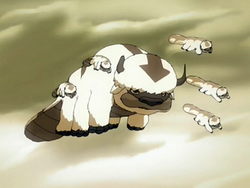 When the State works continuously, the Avatar's eyes, and tattoos in the case of an Air Nomad Avatar, glow white constantly, and the spirits of the past Avatars actively channel their energy, skills, and knowledge through the body of the current Avatar, granting him or her great amounts of strength and power for up to 5 posts. The State works this way almost exclusively when it is triggered as an instinctive, unconscious reaction, a 'defense mechanism' for when an Avatar is confronted with a threat beyond what they can deal with, or when their emotions, specifically rage and sorrow, reach a breaking point. So it may perhaps be more accurate to describe the State being used this way as 'reflexively' rather than 'continuously'. When the State is triggered this way the combined spirits of the past Avatars seem to take control of the Avatar's body and voice, thus the current Avatar has little to no control over the performed actions and may retain little to no memory of what happened, though this is not always the case. When the State is used non-continuously, the Avatar's eyes, and tattoos in the case of an Air Nomad Avatar, glow only for a second, and during that time the current Avatar stores the knowledge and energy needed so that it can be released once exiting the State, taking only the power needed for a specific task. This reduces the danger of being killed in the Avatar State and enables a more willful, controlled use of the Avatar State's power. This can only be done by an Avatar who has mastered the State as it is a conscious use rather than an instinctual response. Mastery of this technique is part of what distinguishes an Avatar as "fully realized". While the Avatar is all but invincible in the Avatar State, having millions of bending experiences, there is one grave weakness - while in effect, every Avatar, or the entirety of the earth's spirit, is present in the physical world while the current Avatars are in the Avatar State. If the one Avatar were to be killed while in the Avatar State, the part of the incarnation cycle that included that Avatar's home country would permanently break and the Avatar of that land would cease to exist. The Spirit World is a parallel plane of reality that coexists alongside the mortal world, and is home to the spirits, immortal supernatural entities which often embody different aspects of life and nature. All past lives of the Avatar reside in the Spirit World. Avatars are capable of meditating and letting their body travel to the spirit world at any time. When doing so, the spirit of the Avatar leaves his or her physical body. Because of this the Avatar's physical body is vulnerable for it will not respond to attacks or even being killed. The Avatar enters the spirit world after a full post of silent meditation. The eyes and Markings of an Avatar will glow as if the body is in Avatar state while meditating and after the body has been left behind by the spirit. Description: Flying bison have five stomachs, flat manatee-like tails, brown eyes, shaggy white fur, and a brown stripe that runs along their back from tail-tip to forehead, where it terminates in an arrowhead. They have six legs with three toes on each foot. A fully-grown flying bison can easily weigh ten tons. They are revered by the Air Nomads for inspiring the art of airbending, just as the badgermoles inspired earthbending, the moon began waterbending, and the dragons introduced firebending. The tattoos of an airbending master deliberately imitate the arrow-shaped markings of the bison. All flying bison employ airbending to fly, using their broad tails to steer through air currents and to defend themselves. They are also able to use their mouths to airbend. Though fairly docile, flying bison can be fierce and powerful opponents if pressed or enraged, possessing great physical strength and airbending skills. Description:The dragon is a large, horned reptile with a long, scaly body that ends in a thin tail. It has four short legs and two very large wings that enable it to fly quickly over great distances. There is also an instance of a green dragon which had an extra, smaller set of wings beneath the usual wings. The dragon is the original practitioner of firebending, capable of breathing fire. Because of the Dragons great wingspan they are also capable of flight. Dragons have a great immunity to fire and it is believed that the only heat that can harm them is lava. Description:The polar bear dog's front legs are stocky and muscular, in contrast to its more slender hind legs. It is covered in a thick white fur coat, which helps it stay warm in the harsh climates of its natural arctic habitat. The polar bear dog has an elongated snout with a black nose and large, bear-like teeth. Its face is framed by two floppy ears and black eyes. The animal also has a long tail. Polar bear dogs are extremely strong creatures and can break through metal using their front paws. Their vicious behavior is the same with those of real polar bears, though when properly tamed, their behavior is most in line of that of domesticated dogs. Due to their size and seemingly loyal nature, these animals can be trained as mounts to cross the snowy plains of the polar regions. These animals are very fast and can swim for great amounts of time without tiring. Description:Badgermoles are enormous in size and have brown fur with one white stripe between two black ones running down their backs and white, mask-like patches on their faces. They have long tails and five claws on each paw. Badgermoles use their noses and sensitive whiskers to inspect objects in front of them. Although they have vestigial eyes, evolutionary leftovers from long-forgotten times when they lived above ground, badgermoles are more-or-less blind; their earthbending abilities allow them to feel the presence of their surroundings in recompense.They enjoy hearing music, which seems to put them in an almost tranquil state in which one can get them to do nearly anything. Badgermoles seem to be the natural predator of the wolfbats. When fully and properly tamed, badgermoles can be used as beasts of burden and can perform tasks such as paving pathways or clearing stone debris. They also have been known to practice earthbending.